With the arrival of the first artist in residence, Trankat Street was launched in Tétouan (Northern Morocco) in January 2013. Trankat Street is a cooperation project between the non-profit organizations Feddan (Morocco) and Sextant et plus (France). Housed at Dar Ben Jelloun, a magnificent Riad from the 19th century in the heart Tétouan’s medina, it includes a Program for Artists in Residence (AIR), an Exhibition Program and an Education Program. 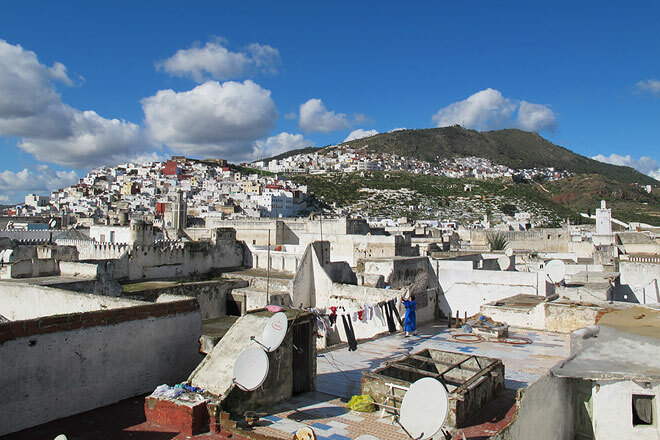 The medina of Tétouan is a rather unknown architectural jewel on UNESCO’s World Heritage List. Labyrinth of narrow cobblestone lanes concealing an intricacy of white houses, its complex organization and traditional features recall the very history of northern Morocco: from the invasion of the Moriscos (Spanish Muslims forcibly converted to Christianity and later expelled from Spain) in the beginning of the 17th century to the Spanish Protectorate. Through intermingling contemporary art and traditional arts and crafts while shedding light on the medina, the project aims to promote the artistic and cultural heritage of the city while developing contemporary art and artistic education in Northern Morocco. In fact, even though Tétouan gathers the main artistic schools of the country and is strategically located on the shore of the Gibraltar Strait, the white city remains remote from the contemporary art bustle that tends to focus on the axis Casablanca / Rabat / Marrakesh. - One of them is identified following a nomination process by the organizations Feddan and Sextant et plus. He or she must be a promising artist coming from the Provence Alpes Côte d’Azur Region (South of France). The first artist in residence is Fouad Bouchoucha. - The two other artists are identified following a nomination process by an international jury. They must be professional and renowned artists, eager to confront their practices with traditional techniques and to engage in an education program with the art schools of the city. For the three months of their residencies, the selected artists live in Dar Ben Jelloun, at the very core of the medina. This immersive journey allows them to apprehend and understand the cultural context within which they operate, while engaging with local communities. Depending on their project, they work in association with craftsmen of the medina and/or master craftsmen of the Arts and Crafts School, in order to develop contemporary challenging art works inspired by traditional Moroccan techniques. Their travel, accommodation and material fees are covered. Per diems and honorariums are also granted. Trankat Street organizes two exhibitions per year, one focused on the artworks produced during the AIR, the second, devoted to artists from the Arab world with an emphasis on Moroccan artists. Both shows take place at Dar Ben Jelloun, as a way to explore the potential of such a richly ornamented environment at the antipodes of the white cube while drawing attention on the medina of Tétouan and its hidden architectural treasures. This program is developed with three main partners: the National Institute for Fine Art (the only National Higher Art School of Morocco), the National School of Architecture, and the Arts and Crafts School (Dar Sanaa). The presence of the artists in residence is a unique opportunity for the students to engage closely with international and professional artists through workshops, internships, tutorials, talks and seminars. Furthermore, with more than fifteen studios ran by master craftsmen and covering all the different ancestral techniques of the region, such as woodworking, metalworking, silk, plaster, terracotta, tiles and mosaic, Dar Sanaa offers the artists exceptional working conditions. In the future, Dar Ben Jelloun will also have an open access resource center, including a library specialized in contemporary art, arts and crafts, and architecture. Trankat Street is based upon a first residency project called "Fayd" in 2009, with Mohamed El Mahdaoui's project at the gates of Tétouan’s medina. Co-organized by Feddan and Sextant et plus, Trankat Street is supported by: the Young Arab Theatre Fund, the Institut Français Maroc, the Institut Français and the Region Provence-Alpes Côte d’Azur, the Roberto Cimetta Fund, the Union pour la Méditerranée, and a generous private donation. Feddan was officially created in Tétouan in 2011 by artist Younès Rahmoun, president, and Bérénice Saliou, artistic director, in order to ensure the development and the implementation of Trankat Street. The organization aims at contributing to the development of contemporary art in Morocco, promoting Moroccan artists in Morocco and abroad, and fostering artistic education in Morocco, through the organization of artistic and cultural events taking place within the private and the public sphere for all sorts of audiences, including the academic one. Sextant et plus is a French contemporary art organization established in 1999 in Marseille. Its team develops contemporary art projects, exhibitions, residencies and publications and is particularly involved in the weaving of links between the artistic field and the private sector (especially companies), the management of large-scale commission works within urban spaces and the conception and implementation of extensive education programs. Sextant et plus is located at La Friche La Belle de Mai, in Marseille and is heavily involved in the management of projects within the framework of Marseille Provence 2013, European Cultural Capital. French independent curator, lives in Marseille. As co-founder and Director of the Trankat Art Residency in Tétouan, she is heavily involved in Morocco. Open to the public during exhibitions periods and special events, or by e-mail appointment. His project at the gates of Tétouan’s medina: Performance, painting, and socially engaged practice.